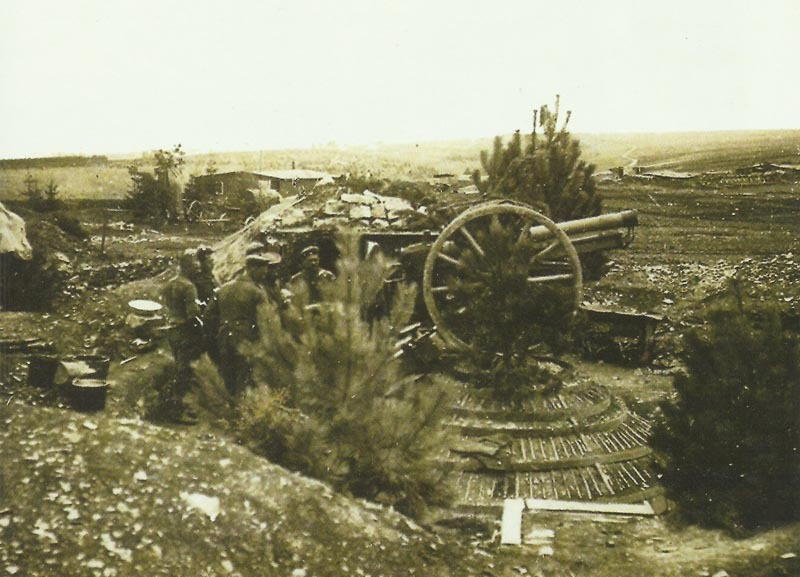 Position of a German 7.7-cm field gun 96, which is temporarily used as anti-aircraft gun and can fire up to an altitude of 13,945 ft.
Ypres: German anti-aircraft fire downs Royal Flying Corps Morane Parasol from 8,000 ft. Champagne: German Alpenkorps (from ex-Macedonian Front) receives reinforcements. Verdun: German advance on Mort Homme, but one German division takes 2,200 casualties. Rain (until April 21) turns ground into thigh-deep morass. Orthodox Easter: 4 Russian Eighth Army rifle regiments fraternize with Austrians who take 135 as POWs. Death of General Plehve, ex-North Front C-in-C (aged 65). Salonika: British cavalry troop (Sherwood Rangers) ambush 2 German cavalry troops southeast of Doiran station in first real clash since 1915. Trentino: Austrian Eleventh Army (8 divisions) now concentrated. Mesopotamia, Kut: Daily grain ration reduced to only 50z from 80z, the 9,239 Indian soldiers finally accept horsemeat. East Africa: South Africans troops occupy Madukani, south of lake Mangara. Britain: Asquith addresses French deputies visiting London. British report on Wittenberg PoW camp published (typhus among 15,000 in early 1915).